For those of you who never played Lords of Waterdeep, it’s a Euro-style game of intrigue and treachery, with five conflicting factions vying for position as top dog in the city. The thing that stood out, thematically, was that not only was it a Dungeons and Dragons Euro, it was a Dungeons and Dragons Euro that really didn’t have any “bad guy” factions. Sure, the good guys did bad things, but it was pretty much about five factions attempting to gain power for the good of the residents, for the most part. Well, the first expansion for this game, which was sent to me by Wizards of the Coast without notice and without me requesting it, changes the aforementioned theme of a bunch of good guys trying to make the city a better place for the people. The aptly-named Scoundrels of Skullport expansion has really bad dudes and non-dudes doing not so nice things and attempting to make the entire city a den of thievery, or at least that’s how it feels. This expansion introduces a new mechanic, corruption, as well as really turns up the heat with regard to sticking it to fellow players. The one thing that I want you to go away with, though, is that this expansion changes the game and how it plays in considerable and noteworthy ways. Before I get into the ways it changes it, I want to mention that this is really three expansions in one box, sort of how El Grande Decennial Edition has a bunch of expansions that you can pick and choose. 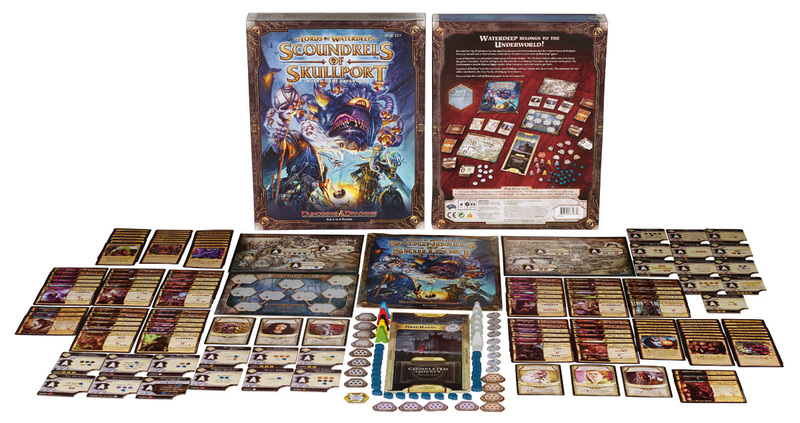 The first expansion is the Undermountain expansion, which has three new Lords which are quite different from the previous Lords, a new sub-board which essentially expands the amount of places you can go, and as a huge change, it has 40-point missions for each type of mission, which, if you can pull them off, are game-changers. The beauty of this expansion is that it’s not really adding mechanics as much as simply opening up the board. The one thing that it does change, and in a big way, is the resource allocations; this expansion’s buildings provide you a lot of resources, so much, in fact, that they now have “5 resource” chits because in the mid-game, you’ll pretty much be loading your tavern with gold and dudes wholesale. This is augmented by the fact that most of these new spaces don’t just give you stuff, they force you to add stuff to the board so that when other players take a space, they get the stuff you left there in addition to the stuff they normally get. Now, do you remember how I said (like 20 seconds ago) that this expansion changes the game? The way that it changes the game is that, like El Grande or Puerto Rico, the base game has a sort of cramped board, where you always seem to have the space you wanted taken by a previous player, and that you never seemed to have enough resources to go around? By opening up the board like this, there are a lot less blocking moves that you can take, and because resources come so fast and furiously, you will spend a lot of time in the Undermountain and you will not be impeded in your quest for resources as you were in just the base game. In other words, it allows you to pretty much do what you want to do, when you want to do it, to a larger degree. It takes the game from a positional battle to get what you need quickly to a veritable smorgasbord of stuff, and buildings generally get to the table a lot faster than they did in the previous game. The second expansion is a real game-changer, though, because it adds an entirely new mechanic, that of corruption. Many of the new cards and buildings in this expansion are tuned to give you something good, but also corrupt you, which is abstracted these little blue skull meeples, and these little blue devils cost you negative points if you have them in your tavern. The truly clever bit about this new mechanic, the one I think is astoundingly smart and well-conceived, is that the amount of points that each costs you slides on a scale based on how much corruption all players have. There’s a little side board that holds the tokens on spaces marked with a negative value, and as more corruption is taken, it uncovers the next highest value, meaning that the more corrupt all “city officials” are, the more damaging these tokens are to everyone. The buildings are far more dark in theme than the old buildings, with such a slave market, a prison, a monster hatchery, and a necromancy supply store, although that is pretty much only elicited in flavor text. 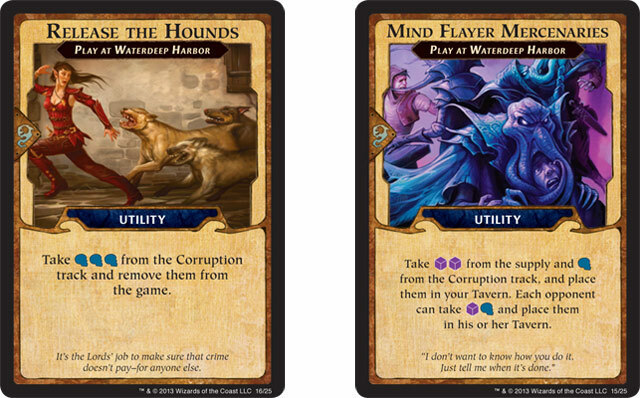 The effects provided at these new buildings almost all revolve around corruption, with some returning tokens to the pool from your tavern and others adding them. The overarching strategies around corruption are such that if you have only a few tokens and other players have many, by taking the last token from a space on the corruption track, you make them more damaging, thereby hurting yourself a little but hurting them a lot, a net gain for you. Furthermore, some new Lords get bonus points for each corruption marker they possess, so by increasing the negative value for the markers, you essentially can negate their bonus, if you infer that they, in fact, possess that Lord. All in all, it adds another layer of depth to the game, and it’s a welcome, and backstabbity, change. The third expansion is pretty much an expansion in-a-card, the sixth player. So, now you can expand this game to include a new faction, The Grey Hands, and as noted, these new Lords are quite different than the previous ones in that they may get bonus points for being corrupt. As an added bonus, you get to play as a skeevy looking beholder, if that rustles your jimmies. You can only play with six players if you add one of the side board expansions, which makes sense as the base game is already crowded enough and with six players it would become nonviable. As a final note relating to how to implement these expansions, you may put one expansion or both expansions into play, especially when six players are in the mix, and there is a new optional rule for longer games, which revolves around the number of agents that each player has to begin with. 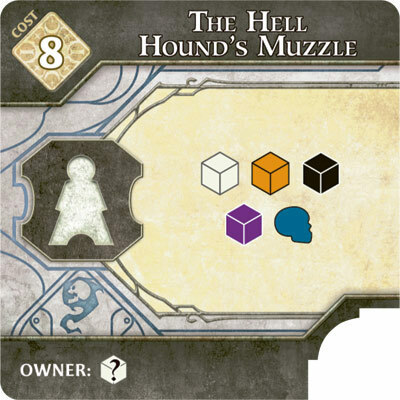 The expansion has one extra agent meeple per player in the set, so that if you play a two player game with all the bells and whistles, you start with five agents. When playing with both expansions at once, though, there are some setup changes that you need to take into account, and luckily, each new card is marked with an Underdark or Skullport symbol so that when you put the game away, you can more easily sort the cards into their respective pools. In the final analysis, this is a welcome expansion in that it isn’t the typical expansion that has become prevalent in the hobby game world; the kind that just pile more of the same on top of a base game or that fix flaws in a broken base game. These expansions add depth to the game, change the conditions of the game, and with the new cards, add new, interesting, and in some cases, infinitely harder quests. This expansion retails for $40.00 but can be had from online retailers for $27.00, and I think that if you’re a fan of the base game, this is a really cheap way to truly expand and alter the way the game plays. I’m not sure that if I was a person who primarily plays two-player games that I would recommend this, because it spreads things out so much, but if you play three through five player games, or want to be able to table this with six, it’s a must-have expansion. As per Circus policy, I gave the base game away after review, since it was sent for review by Wizards, and so in order to play this, I had to buy the base game again, which I did immediately after I sent the subscriber my review copy. Just as last time, I’ll be giving this expansion away as well, and I will most assuredly be buying this in the short term, because as much as I enjoy the base game, this adds so much new and different content that the base game, after playing it as many times as I have, will seem to be a little less shiny. 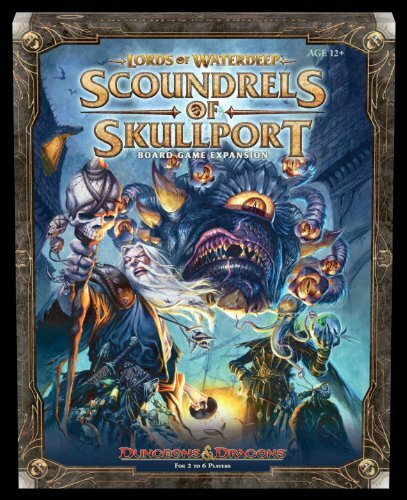 This is a must-have expansion for Lords of Waterdeep unless you’re only playing two player games, and even then, you’ll probably enjoy it. Wizards didn’t just add more of the same, they changed quite a bit of the game, and in really smart ways, and in such a way that you can play one of four ways, which will assuredly add replay value. All in all, for under thirty dollars, it’s a hell of a value proposition for fans of the original. 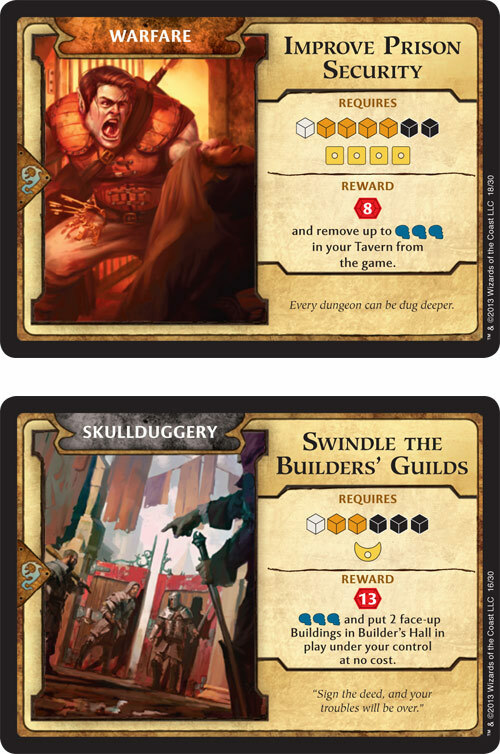 All of us really enjoyed the new options, and we all agreed that each mini-expansion adds something new to the base game, although the corruption aspects of the Skullport mini-expansion is the star of the show. Previous PostCircus Train – VPG’s Gold Banner Game Gave Us Wood For Lions And Tigers, Oh My!Next PostPost-Apocalytic Wanderers Need Fast Food Too!